No spam. No secret third-party email. No selling, loaning, sharing or any other "ing" of your personal information without your consent. Appliances can be returned within our time of operations. Monday - Saturday from 9am to 6 pm. All Sales are final. In certain circumstances you may return a product before it is delivered or if the given appliance it is not working properly, then it would need to checked out by one of our techs; only after they have determined what is wrong with the machine. If the repair of the machine is too high to repair, then we will exchange the item for another or issue a refund, this decision remains with the owner of the business. If customer requests warranty service and the problem is caused by the customer (such as a clogged drain, improperly installed water hoses, unlevel appliance, blown circuit breaker, objects in fans or pumps causing machine to malfunction etc. ), or any other malfunction caused by customer, then customer will be responsible for the cost of the service call $30.00. There are no refunds. Items such as self-cleaning mode, leveling legs, broken shelves, cosmetic items, fill hoses, and any item resulting from customer's misuse are not covered under this warranty. If you take your appliance home in your own vehicle, you understand that only major mechanical errors to parts such as motors, belts, timers, compressors, fans, water pumps, heating elements, and lid and door switches are covered under this warranty. If you damage the item during transit or installation, it is not the responsibility of 3 Bee’s Appliances to repair or replace the item. Should 3 Bee’s Appliances need to make repairs, a service call will be scheduled within three (3) business days of reported mechanical failure and said repairs shall be completed within seven (7) business days from the time all parts are received by 3 Bee’s Appliances. If customer or a third party other than that ordered by 3 Bee’s Appliances works on your appliance, the warranty from 3 Bee’s Appliances is null and void. 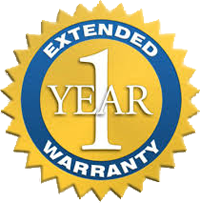 This warranty is extended to the original purchaser as set forth in the invoice and is not transferable to subsequent purchasers of the appliance. 3 Bee’s Appliances shall not be responsible for any damage caused by appliance failure including, but not limited to, fire, flooding, personal injury, death, damage to personal or real property such as spoiled food, or any other liability whatsoever. The following is specially excluded from warranty coverage: misuse, abuse, improper transportation, installation or operation of the appliance, the modification of the appliance, or damage to the appliance due to the negligence of the customer. If you have a trade-in or 3 Bee’s Appliances delivery team removes your old appliance, you understand that 3 Bee’s Appliances will attempt to repair and resell your appliance and any other items or accessories in/or the unit. You waive ownership of this appliance as soon as you trade it in. Is for one trip only. 3 Bee’s Appliances takes no responsibility for damage to items that are taken home by customer, left at the home while customer is not there, or for any damage due to the delivery of your appliance(s). 3 Bee’s Appliances reserves the right to refuse to sell to any person for any reason not prohibited by law, including, but not limited to, abuse of its return policy.